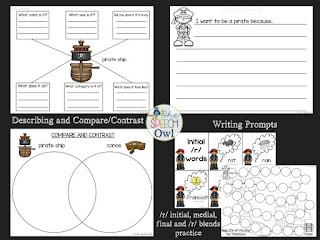 The Speech Owl: Talk Like A Pirate Day Linky Party!!! 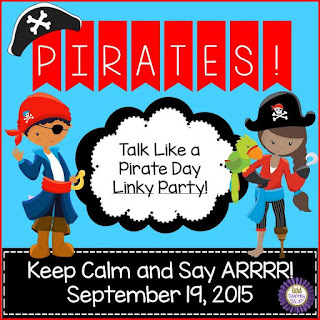 Talk Like A Pirate Day Linky Party!!! Ahoy, matey! 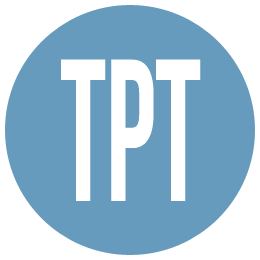 Did you know September 19th is “Talk Like A Pirate Day”? Many SLPs will be using pirate themed therapy materials all week in preparation for this oh so special day!!! 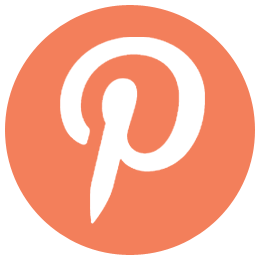 My sweet friend Tracy, from Gold Country SLP, is throwing a pirate themed linky party to make sure you are set with all the best pirate themed products from TPT! ***Note: When you purchase this book companion you receive both a color version and a black/white version!!! Look at all of the skills addressed in this book companion! There’s something for just about everyone on your caseload and you can easily adapt many of the skills based on age and ability levels! This book is full of both tier 1 and tier 2 vocabulary! Working on object functions? There are 2 different levels included. 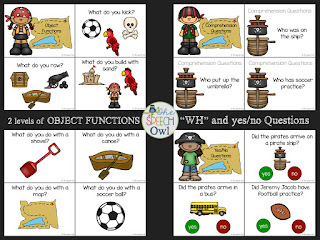 This book companion also includes cards to assist with “wh” comprehension and yes/no questions. 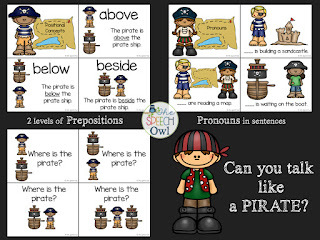 Working on prepositions? No problem...let’s see where those pirates are hanging out! Talk about these simple pictures to address pronouns in sentences. Working on plural nouns or past tense verbs? No problem! 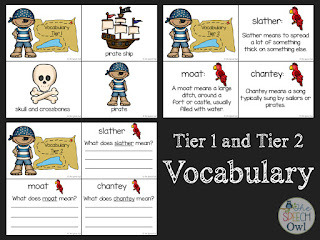 Do your older kids need vocabulary practice? 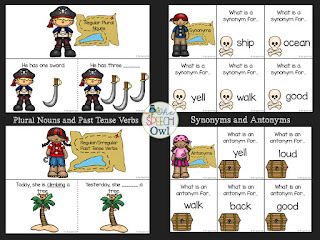 How about some synonyms and antonyms related to the story? 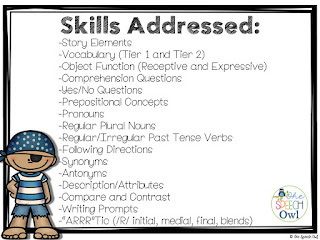 How many of our kids need work on describing? Taking those descriptions and using that information to compare and contrast is tough for our kiddos! Have an artic kid instead of a language kid? No worries! I have included target cards (including images) for /r/ in all positions and blends, with a game board for reinforcement. Smartly, me lass...run, don’t walk to The Speech Owl’s TPT store and grab this Book Companion!!! Here are some other pirate materials you might want to check out! 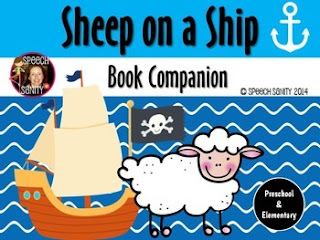 1)This Sheep on a Ship Book Companion from Speech Sanity looks so cute! I don't know this book, but love learning about new books for therapy!!! 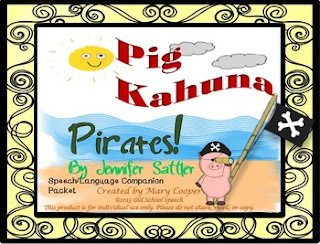 2) This Pig Kahuna Pirates Book Companion from Old School Speech look fantastic also!!! Another book I don't know, but can't wait to check out! 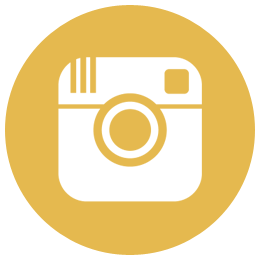 Click here to voyage back to Gold Country SLP’s blog to see all of the other links! Thanks for hosting Tracy! Hope you're staying safe out there! I love book companions and will be adding yours to my growing list!! Wow! 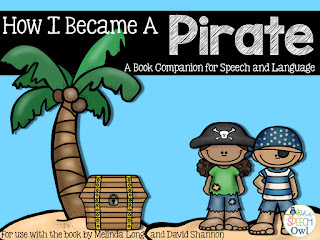 Your "How I Became a Pirate" looks so comprehensive. I'll be adding that to my wish list! Thank you so much Speech Peach!